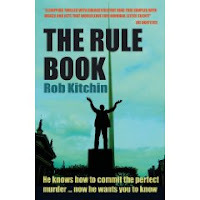 I rarely read reviews of a book before reviewing it myself, but Rob Kitchin's new Irish serial killer novel breaks so many rules of crime writing (an irony perhaps intended by Kitchin in his title and the books premise: The Rule Book) that I went looking for other opinions before trying to formulate my own. The most useful review was by Critical Mick (see his review here), who remarks on Kitchin's rule-breaking style as well as other aspects of the book. I fully agree with Mick's praise of the book's success in pulling in the reader, as well as his analysis of Kitchin's twists on the serial killer genre in film and fiction. I also agree with one of his criticisms of the book (that there are a number of proofreading errors that may not be the author's fault) but disagree with a couple of others. Mick says that the police procedural method is followed too closely and accurately, perhaps confusing the reader with the numerous detectives' names and activities: I for one am a big fan of the police procedural as a genre, and Kitchin gives us an excellent version, emphasizing not the lurid crimes committed by the serial killer but the sometimes plodding pursuit of the killer in the detectives' meticulous methodology. I also disagree with Mick that the setting is evoked with perhaps too much realism. I haven't spent that much time in Ireland, and have never been to Maynooth or some of the other particular settings, but I found Kitchin's descriptions of these places evoked a real Ireland, a real picture of the place that formed an excellent "frame" for the fictional events. Kitchin's background in geography and mapping provided not only some conceptual elements in the plot and action, but perhaps also the background for his skill in sketching out his portrait of Ireland (and like Mick, I appreciate that the places in The Rule Book are not fictionalized equivalents, but actual places we might either recognize or visit. Mick mentions that Kitchin breaks a big crime-novel-plot rule in his ending (which can't be described without giving too much away): I can admire Kitchin's daring and his accomplishment in this particular case while still being a bit frustrated by it. You'll see what I mean when you read the book--which I highly recommend you do. The story follows Detective Superintendant Colm McEvoy's dogged pursuit of a serial killer who leaves behind a "rule book" that demonstrates his genius and lays out a plan (partly in code) of 7 murders in 7 days. That "rule book" provides the title and the structure, without overwhelming the narrative drive, mostly maintained in the dialogue among the cops (sometimes professional, sometimes emotional). As the killer progresses through his plan, the police have immense difficulty in keeping up with him, much less identifying or catching him. In a few instances, the killer is lucky, but in most cases, his rules (not always followed exactly) are proved in his acting out of them. McEvoy is frustrated not only by the killer but by an ambitious subordinate and back-stabbing superiors in the Gardai. He is also hampered by his own emotional and physical state (he's a wreck, in the aftermath of his wife's death, leaving him as a single father to a 12-year old girl). McEvoy's turmoil is believable and not overwrought, and the dialogue among all the police is also natural, not strained or over-written. The story is told in the third person mostly from McEvoy's point of view with occasional short segments from the point of view of the killer and that of a couple of the other cops, plus one of the victims. That focus on McEvoy tightens the drama without overly limiting the reader's perspective. And the story is tight indeed, moving along at an electric pace that never lets up. Kitchin's skill in maintaining that pace as well as the naturalism of the characters and setting is quite impressive in a first novel. A sequel is implied in the text (and Kitchin mentions he's working on the third McEvoy novel in an interview by Gerard Brennan here), and I'm hoping the sequel doesn't take long to arrive.